The closed St. Louis Church in Auburn. A group that bought a historic Auburn church in 2014 for $75 to save it from demolition is now giving the landmark building to the city for back taxes, the Sun Journal reported. 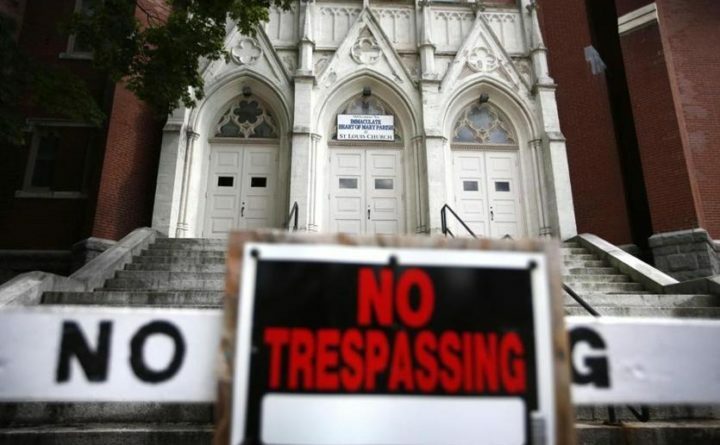 The neo-Gothic St. Louis Church at 80 Third St. was closed in 2013 after nearly a century, and the Roman Catholic Diocese of Portland sold the property to Pilotage LLC for a small amount of money the following year in hopes the aging structure could be renovated and reused by the community. But this month, that redevelopment group announced it would give the church up to foreclosure, according to the Sun Journal. The group owed property taxes for 2015 and 2016, and the city had tax liens on the property for 2017 as well, the newspaper reported. “Although we have not been able to find a viable use to keep this historic building as a vital component of the New Auburn community, we take pride in preventing its demolition for more than four years,” Pilotage manager Noel Smith wrote in a letter to Auburn City Manager Peter Crichton, the Sun Journal reported. Auburn Mayor Jason Levesque told the newspaper he hopes the city will find a way to preserve the landmark building.